What if we have been wrong about learning? Learning may have more in common with marketing than we thought. Looking at marketing and learning's common root, How People Learn shows L&D professionals a new way of thinking about learning by exploring what happens when we learn. It considers applications from AI, marketing and ethics and is informed by psychology and contemporary neuroscience in order to show L&D professionals how to design training with their employees and mind so that training makes a real difference to skills, capabilities, performance and development, rather than being a waste of time, money and resources. Using the author's '5Di model', How People Learn demonstrates how to define, design and deploy training in a user-centred way so it works both for and with employees. It also includes guidance on what training resources to create when employees are actively searching for learning content. Using this book, L&D practitioners will be able to use pull and push techniques to provide content that people use and experiences that transform their behaviour. 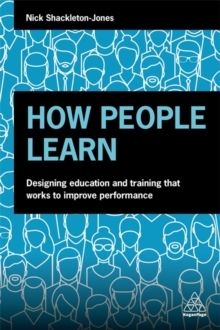 From how to use simulations, storytelling and anticipation to the importance of observation and status, this book gives L&D professionals everything they need to build effective training programmes and learning experiences. With a forward by Dr Roger Schank, the Chairman and CEO of Socratic Arts and Executive Director of Engines for Education, and case studies from companies such as BP and the BBC, this is an urgent read for learning professionals.